A photograph of GOP presidential contender Mitt Romney at a 1994 Planned Parenthood fund-raiser has surfaced, once again raising questions about the former Bay State’s governor’s abortion flip-flopping. 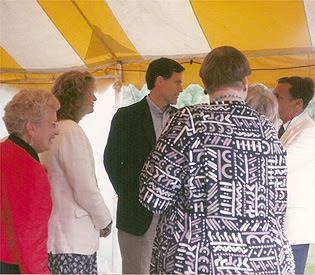 The picture, a copy of which was obtained by the Herald, shows Romney and his wife Ann at a house party fund-raiser in Scituate with Nicki Nichols Gamble, who was the president of the Planned Parenthood League of Massachusetts at the time. Romney has already downplayed ties to Planned Parenthood after revelations that Ann Romney donated $150 to the group. Gamble said the pic was snapped at an event at GOP activist Eleanor Bleakie’s house and that she “clearly” remembered speaking with Romney at the event. At the time, Romney was running as a pro-choice Republican against U.S. Sen. Edward M. Kennedy (D-Mass. ).